Photo submitted Morehead State senior Luke Keller. Former Valley football player Luke Keller did not experience a normal high-school career, on or off the field. Keller was diagnosed with separation-anxiety disorder. He was also suicidal. After telling his mom, Dawn Keller, about the depression, Keller began counseling but the therapeutic treatment never cured Keller’s condition. One day, with suicidal thoughts still running rampant in his mind, Keller went home from school and found a list of chores his mother had left for him. One of the chores was mowing the grass. In an attempt to clear his mind, Keller complied with his mother’s request. However, while he was mowing the lawn, Keller continued to contemplate taking his own life. Before he finished the chore, Keller decided to take a different route — as it turns out, a life-altering route. “I said ‘God if you are real. If you are what people say you are, then tell me something because today I’m going to end my life. I need you now if you’re real,’” Keller said. “I was in the middle of mowing my grass and was so completely overwhelmed because I truly didn’t believe in God before,” Keller said. After playing every football game during his junior season with suicidal thoughts and battling depression, Keller finally found the cure. Keller had already decided not to play football his senior year but felt like God wanted him to play, so he rejoined his teammates for one last season. His senior campaign turned out to be a memorable one, filled with many awards and accolades, but the biggest impact was felt on the field. After every touchdown his senior year, he would get down on his knee and point up to the sky in a moment of thanks. However, not everyone was a fan of the celebration. Once Valley reached the postseason, Keller was warned about his touchdown celebration. If he continued to take a knee and point to the sky, the officials would consider it an act of taunting and penalize the Indians. Keller never received any warnings in Valley’s first-round playoff victory. However, the second round was a different story. Keller scored an early touchdown, knelt to the ground and then made his way back to Valley’s bench without any problems occurring. On his second touchdown, Keller knelt to the ground and an official rushed toward the running back in anger and was animated with Keller about his touchdown celebration, which had become as routine as an Indian victory that season. After a brief conversation where Keller attempted to explain his sincerity in the post-touchdown activity, the official followed Keller back to the Valley sideline and warned Indians coach Darren Crabtree about the celebration and the repercussions, which is a 15-yard personal foul penalty — two in a single contest results in an automatic ejection and according to Ohio High School Athletic Association rules, a suspension from the following game. At halftime, Keller received a note from his sister, which said “be patient and let God work.” Keller took a step back and remembered a bible verse he had studied prior to the game. Keller returned to the field and scored his third touchdown of the night, but this time he didn’t perform his customary touchdown celebration. As Keller jogged over to the sideline with tears in his eyes, something compelled him to turn toward the Indian fans. “I turned around and every single Valley fan was on their knees, pointing to God,” Keller said. “I was so overwhelmed. I think there were seven some thousand people in the stands and every single one of them were doing it for me. After Valley’s postseason run, Keller began receiving interest from collegiate programs. However, he was being recruited as a linebacker and not running back, which was his goal. 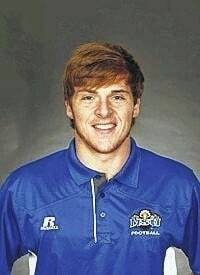 The Morehead Eagles were the only team that recruited Keller as a running back but unlike the other institutions, they were not offering scholarships. The night before he was eligible to sign, Keller had a dream the Eagles were playing and that’s all it took for him to sign on the dotted line. Part two of the story will appear in next Sunday’s edition of the Community Common. Reach Chris Slone at 740-353-3101, ext 1930, or on Twitter@crslone.